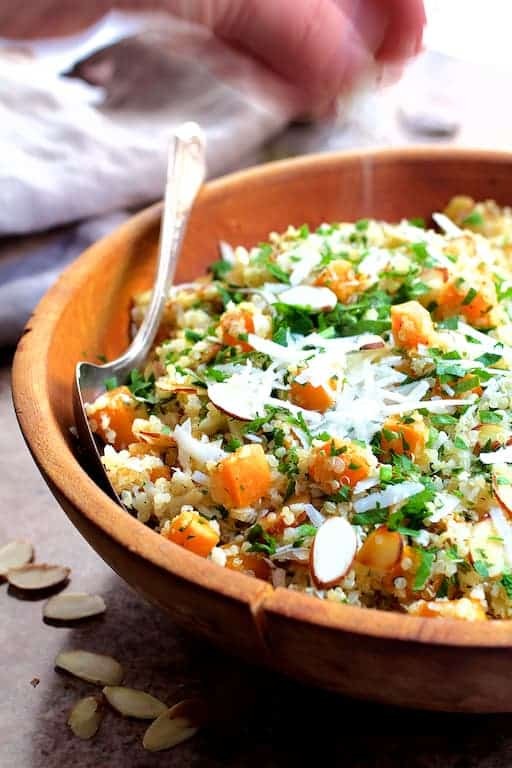 Lemony Quinoa with Butternut Squash, Almonds and Parmesan Cheese is perfect as both a side dish and vegetarian entree! I’ve also got the easiest quinoa cooking method EVER for you! 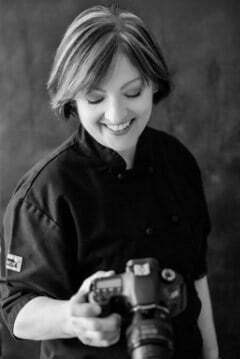 Not long ago, I had a quinoa-cooking disaster while working for a personal chef client. I’ve always found this hot and trendy little grain/seed difficult to cook and always hold my breath. Am I the only one? Cook it like rice “they” say with a 2:1 water to quinoa ratio. I cook A LOT of rice for clients. In fact, one of my clients grew up in Sri Lanka and I pretty much have to make a side of rice with every one of his meals. Quinoa does not cook up like rice. Stop it, people. Stop it now. 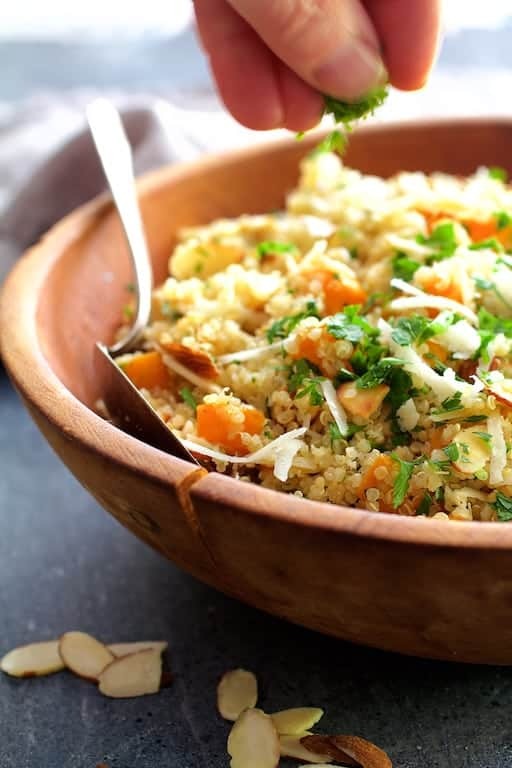 I’ve had great success cooking quinoa using the method I outlined here. And then, that fateful day at my client’s home, I couldn’t get Ancient Harvest, the brand that I normally use and which does not have to be rinsed first. (All other brands require rinsing to remove saponin, a bitter coating on the outside of quinoa.) It went downhill from there. My quinoa was overcooked glop. Thankfully, I had plenty left in the bag to play with. I didn’t have a whole heck of a lot to lose so I decided to cook the quinoa the way I cook brown rice: Bring a saucepan of water to boil, salt it and just boil it until it was cooked. OMG. Best. Quinoa. Ever. Fluffiest quinoa. Ever! Be sure to watch the quinoa so it doesn’t overcook. When the germ appears, test it and drain immediately. What makes brown rice gloppy is cooking it in its own starch (which is what you want to avoid with pasta). It makes sense that quinoa cooked in its own starch would turn gloppy. However, boiling it and keeping it moving, then draining it keeps the starch from adhering to the quinoa which is what makes it sticky. 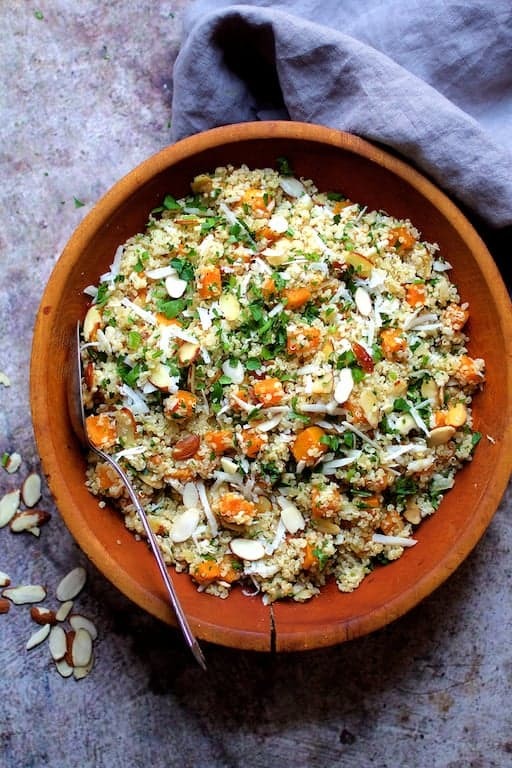 And now for some Lemony Quinoa with Butternut Squash, Almonds and Parmesan Cheese joy! Butternut squash can seem intimidating to peel at first. It’s not difficult once you master the technique. First, select a squash with a long neck. This means you’ll have plenty of flesh and less cutting around the seedy part. Slice the neck into approximately 3-inch lengths then place cut side down on a cutting board. 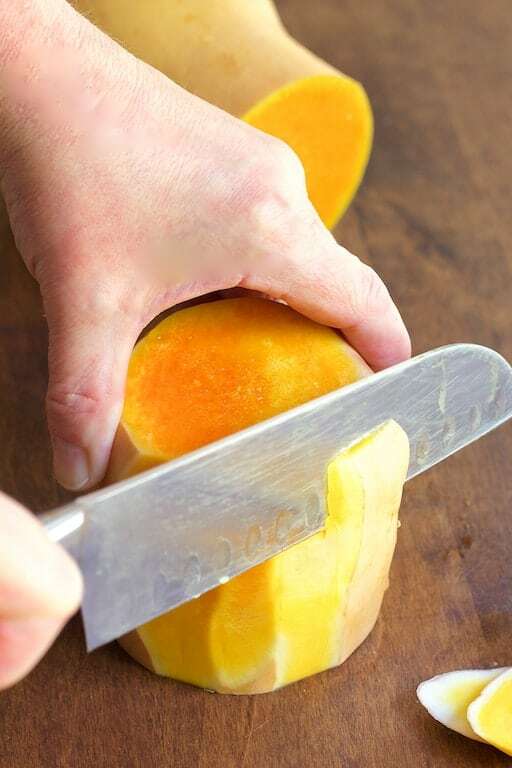 With a good, sharp knife, slice downward toward your cutting board, rotating the squash as you remove the thick peel. If you miss a little like I did here, just clean it up after you’re finished rotating the neck of the squash. To peel the bottom of the squash (the part with seeds), slice it in half from the top down. Place the seed side down and slice into ½ to 1-inch half moons. Remove the rind, seeds and fibrous part with a paring knife then cube remaining flesh as desired. The other mildly tricky part of this dish is toasting the almonds. I do it in a nonstick skillet on the stovetop. 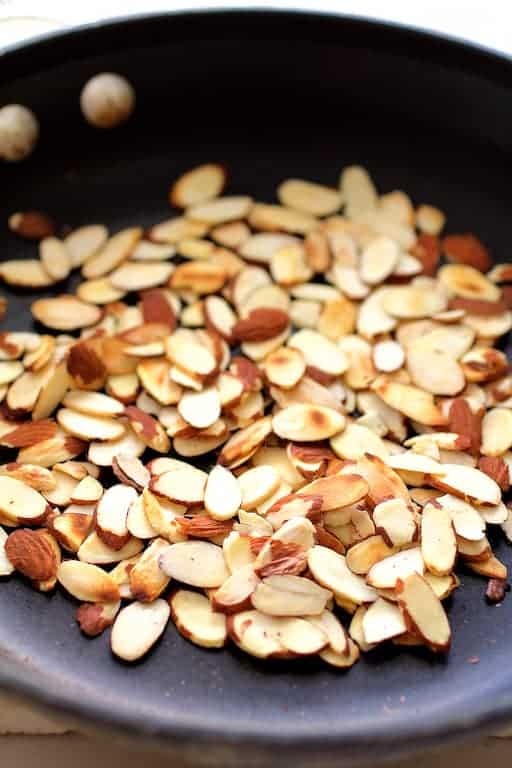 Toss the almonds several times and take them off the heat as soon as they’re lightly toasted. They can go from zero to burned quickly. I like to remove them from the heat as soon as they’re fragrant. That’s it! 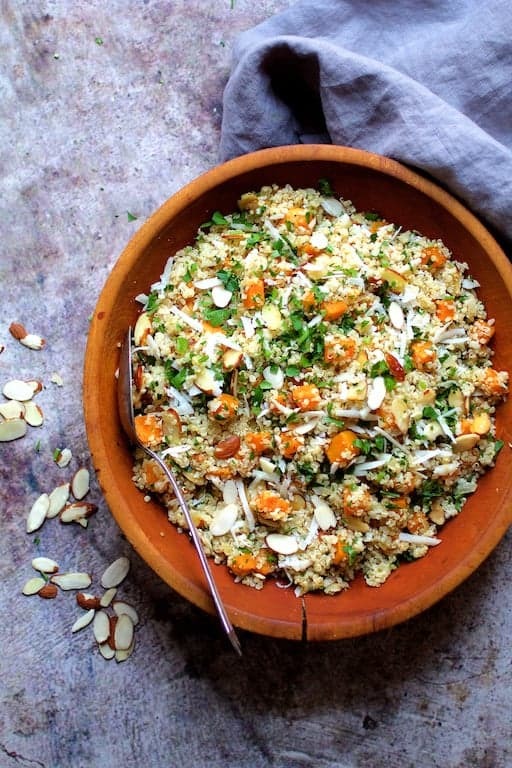 Lemony Quinoa with Butternut Squash, Almonds and Parmesan Cheese! A healthful side dish for roast chicken, fish or pork. Hearty enough for a vegetarian entree. Let’s eat! Preheat oven to 375 degrees. 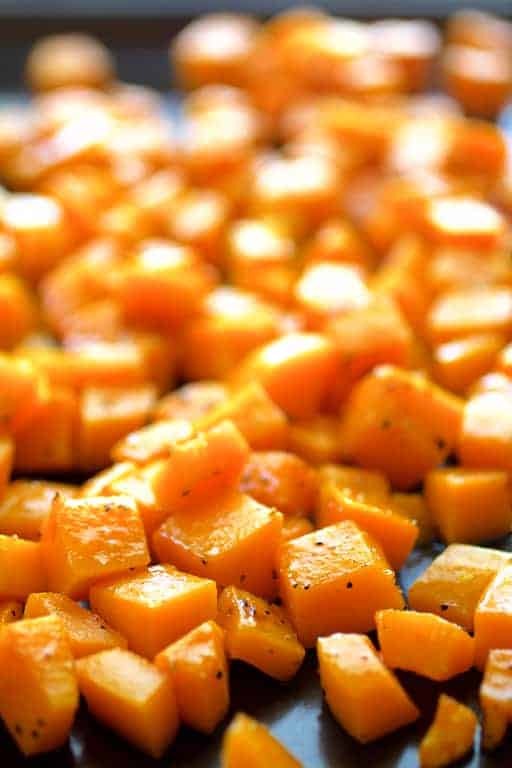 Toss cubed butternut squash with 2 tablespoon olive oil and salt and freshly ground black pepper, to taste. Roast for 25-30 minutes or until tender. Keep warm. Meanwhile, bring a saucepan of water to a boil. Add salt, then add quinoa. Bring back to a boil and cook for 12 to 15 minutes or until quinoa is cooked and "germ" is showing. Drain through a fine sieve. Set aside and cover to keep warm. Heat a nonstick skillet over medium-high heat. Add the almonds and lightly toast, 3-4 minutes or until lightly browned in places. Immediately transfer to a small plate so the nuts do not burn. In the same nonstick skillet, heat remaining 2 tablespoons olive oil over medium heat. Add the onion, reduce heat to low and cook, stirring often or until onions are golden and tender, approximately 8-10 minutes. Add the garlic and thyme and cook 30 seconds or until fragrant. Stir in lemon zest and juice. Return squash and quinoa to the skillet. Add parsley and Parmesan cheese and toss well. Serve immediately. I love butternut squash but avoid it sometimes just because I hate peeling it so much – these tips are great, though! I’m going to have to try it! Thanks, Melissa! 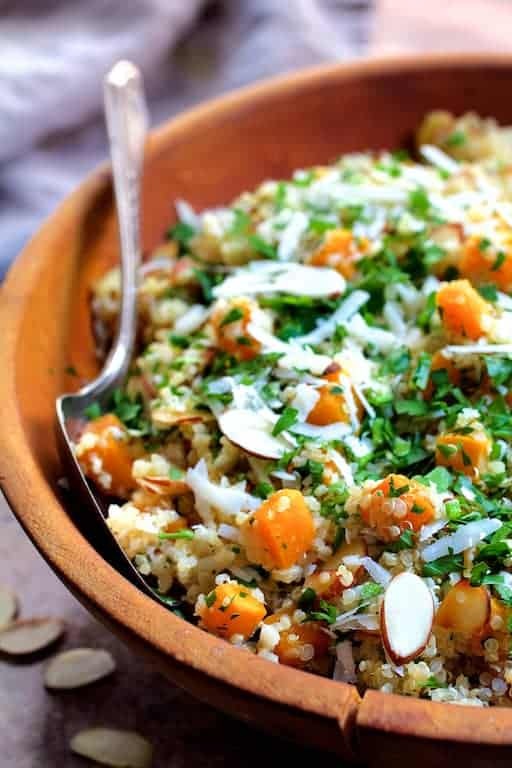 I do a lot of butternut squash for my clients and this really is the easiest way I’ve found. Hope you enjoy! Thank you, Anne! So glad you enjoyed! Another amazing looking recipe Carol, can’t wait to try it! I’ve been having LOTS of butternut squash lately and still happen to have some frozen from my last recipe so I know what I’ll be making this weekend!! Hi, Carol! We cook LOTS of quinoa. We buy it at Costco and it’s in a huge sack and it does not need to be rinsed. It’s under the Kirkland brand. If your clients like quinoa, this would be economical. Hope you can find it. Love the recipe — we have all the ingredients. When we make it I’ll tag you on Instagram. Thanks, Marisa! I can’t buy things like that in bulk, store and then use for my clients. Everything is purchased on the day I cook for them. Love knowing I don’t have to rinse the Costco brand, however. Wish more brands were like that!